1. Please try to install its internal driver directly. After plug it into your computer, you will see there a new USB device folder in your computer, then double clicks to install the driver. Please search " Download - Hoplaza " from GOOGLE. 3. It's better to turn off anti-virus software and low down the firewall level before install the driver. You can turn on them after installation. It takes about 6-10 seconds to mirroring from PC to TV, after you get everything ready. ◎If found it can't convert picture well, please check if you plug the adapter on a USB3.0 port or not? And check the HDMI extend cable version you using, the HDMI version at least be V1.3 or higher, or it can't support high resolution data transmission. ◎ If your computer have USB 2.0 port only, DON'T BUY this adapter. It also support USB2.0 port, but for USB2.0 port the max resolution only 800*600. ◎This USB3.0 to HDMI cable supports Audio Output, make sure that the USB PnP Sound Device is installed and you have set that as the default device and raise the volume in the Attribute. ◎You may can not make it to work smoothly due to the computer incompatible problem. Please feel free to contact our Customer Service Team, we will try our best to solve the problems. 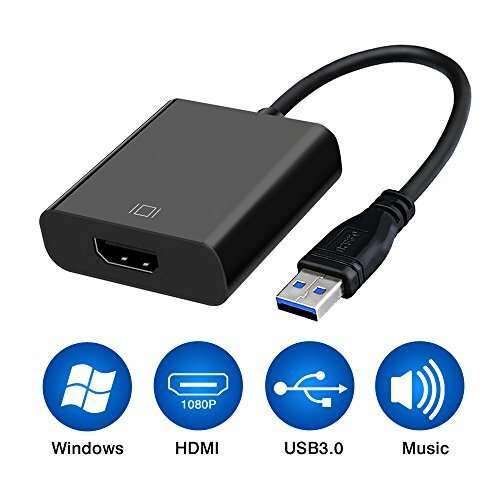 【USB3.0 to HDMI CONVERTER】 Insert the USB port on your computer, and connect an HDTV, monitor, or projector via extra HDMI cable ( cable not included ); Then you can use a second display to increase efficiency. ---- NOTE: ONLY Support Windows 10, Windows 8, Windows 7 Computers. 【MIRROR / EXTEND DISPLAY】Whether showing movies on a big-screen HDTV or expanding a workstation by extending a desktop to a second monitor or mirroring screens for a better presentation on a projector, this USB3.0 to HDMI adapter make a convenient connection. Supports multiple monitors with additional adapters. 【1080P FULL HD VIDEO】This USB3.0 to HDMI Adapter allows for video resolution up to 1920*1080P full HD, ideal for home theater entertainment, conference room, office or teaching at school etc. 【SUPER SPEED】Transmission Speed of USB 3.0 is up to 5Gbps for the best performance, equal to an external graphics card to deliver smooth high definition video to your HDTV/ projector or monitor. 【SIMPLE INSTALLATION】 This USB3.0 to HDMI Adapter with internal drivers for download; If you cannot get it work with the internal driver in the device, please manual download & install the latest driver from our website, Please search " Download - Hoplaza " from GOOGLE. If you have any questions about this product by RayCue, contact us by completing and submitting the form below. If you are looking for a specif part number, please include it with your message.